"First of all, PrimaLuna Dialogue Premium is a good amp with very good construction with very good sound. You can see several test reports made by well-known audiophile internet magazines. But there is some place to improve it. If I had an AirTight or AudioNote I wouldn't touch it. Tube rolling is an easy way of tuning, but I don't want to deal with it now. The resistors in the signal path are Takman made Carbon film, the potentiometer is Alps, I think they are good enough. But I had my doubts with its cheap coupling capacitors. PL uses the same type of capacitor for coupling the output EL34 tubes and filtering the noise of the big Nichion made 500 V DC electrolyte capacitors. This raised my suspicion. I am speaking about the slightly flattened white polypropylene foil capacitors; it is the OEM product of a well-known producer; you can see several one inside PL. 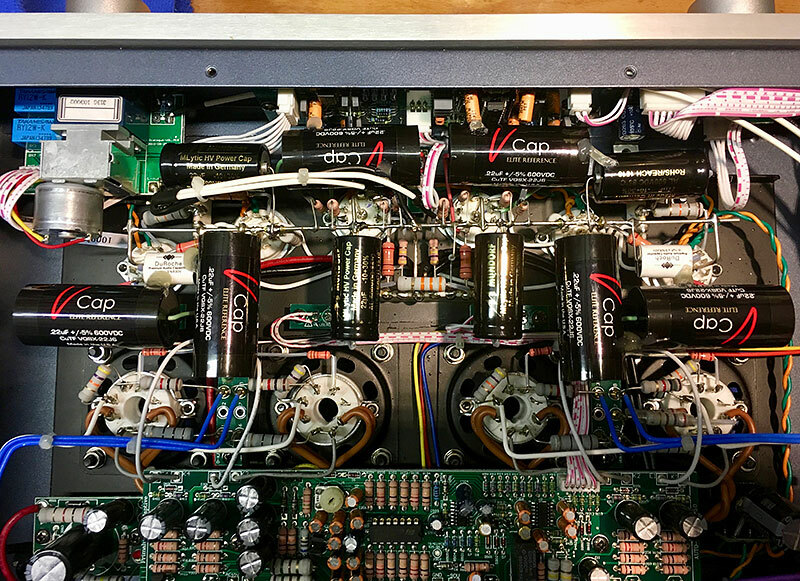 The only exceptions are the two Solen SCR coupling capacitors in the driver section, at the two middle 12AU7. . So, this way I came to the conclusion to replace all the coupling capacitors. I had to carefully consider using V-Cap CuTF condensers, because they present approximately 25% of the price of the whole amp! But it was worth it! I read several reviews like this one, before I made the decision. Some guys took the trouble and tested several types of capacitors and compared all the results. The result was always the same: V-Cap CuTF is the best. The sound became much more clear and detailed. The low ranges also became more real. No matter what the jazz band is, how many musicians play, the play of the double bass is clearly audible. This is not to the detriment of warmth and musicality but to its advantage. The difference is very audible. The PL jumped one big step above; it is now in the range of the 6000+ amplifiers. Another aspect: This PL has no headphone outlet. I had to make a voltage/current divider to be able to use my Audeze LCD2.2. PL Dialogue Premium HP amp has headphone connections, and it uses the same method. I tried some variations with the resistors, but I was not able to totally suppress the very little residual hiss. In spite of this, the PL is a very quiet amplifier with my 91 dB speakers, but the LCD 2.2 is a very sensitive headphone; 101dB. Beside this hiss I had a microphonic-kind noise from the left side. After replacing the capacitors with V-Caps, both problems disappeared totally. My Audeze headphone has no background noise any more. Summarizing the improvement: the amp became much more quiet, very detailed, clear and more realistic. Beside it also kept its famous warmth and musicality. It's as if I had cleared it from dust. Congratulation to Chris for engineering and producing these very nice capacitors! 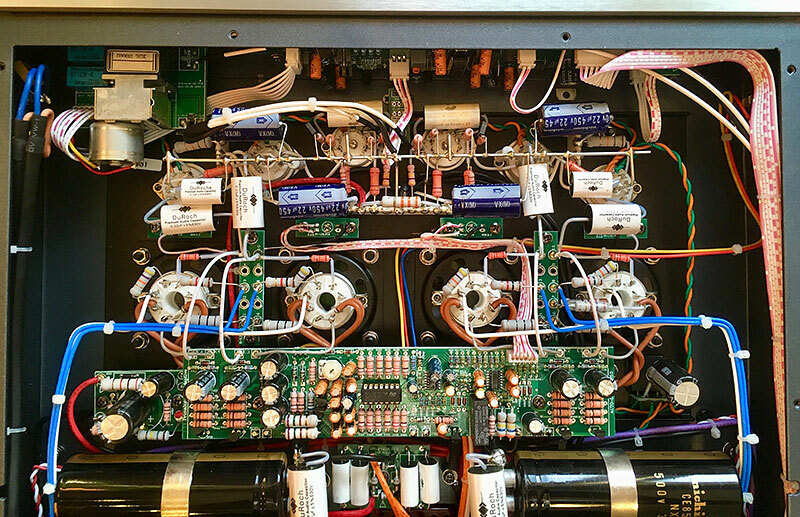 Zsolt Andrásy's PrimaLuna Dialogue Premium Integrated Amp setup with V-Cap CuTF inside. DAC - Soekris dam 1021 DAC with own-built power supply and with Jensen coupling transformers. It is an R2R DAC in last picture. About Zsolt: "I only listen to jazz and classical music. I bought my first “audiophile” system in 1991. Of course at this time in Hungary it was not a real audiophile set, but it was at least non-injection molded plastic made. Since than I continuously try to improve my system. I think is the most interesting point of my attitude is I listening music instead watching TV.